My grandparents were born in Pennsylvania's steel belt to Czechoslovakian immigrant parents. Childhood visits to see them were always filled with cabbage rolls and pierogies laden with fried bacon and sour cream. My grandmother showed her love with plates and plates of food, and we were only too happy to oblige. Needless to say, I have not had any pierogies since going vegan over 2 years ago. I noticed these frozen pierogies in the grocery store this week and was surprised to see they had no egg in the dough or cheese in the filling. I sauteed up some red and yellow onions in margarine and put them atop the pierogies. They are not even close to my grandma's, but it was fun to have something different for dinner. 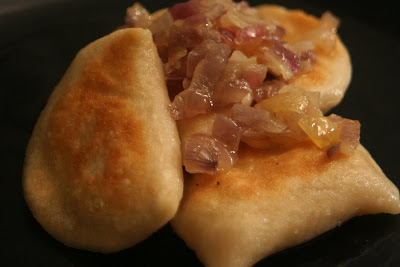 I am going to try to make a vegan pierogie next month, and dabble in cabbage rolls as well. Stay tuned!